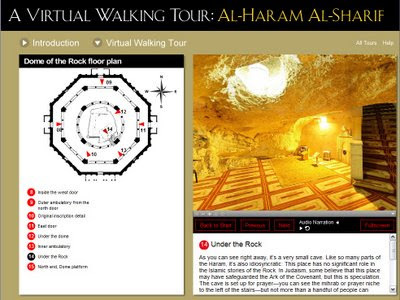 The January/February 2009 issue of Saudi Aramco [yes, the oil company] World magazine (v60 #1) features a virtual walking tour of Al-Haram Al-Sharif (i.e., The Temple Mount) in Jerusalem. [HT: G.M. 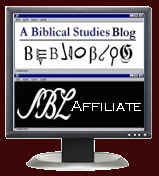 Grena on biblicalist] It really is an excellent tour. HERE IS THE LINK to start the tour. You will find an easy to navigate site with full 360 views along with zooming. You can either let the tour run automatically or wander off on your own. The photography--by Michael and Barry Gross who also worked on the "Rome Reborn" project--is outstanding, providing a number views most tourists will never get. 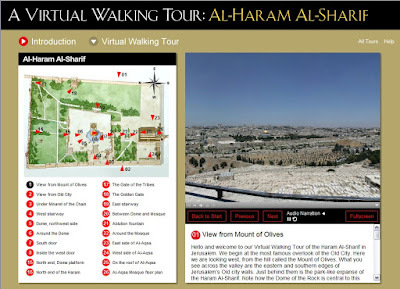 You can move around the views while listening to the audio guide or simply read the narration written by Oleg Grabar, Professor Emeritus of Islamic Art and Architecture at the Institute for Advanced Study at Princeton, New Jersey. He is the author of The Dome of the Rock (2006, Harvard) and The Shape of the Holy: Early Islamic Jerusalem (1996, Princeton). There are 32 quality views in all, including both exteriors of the the mount as well as interiors of the Dome of the Rock and Al-Aqsa. Though written primarily from the perspective of Islamic history, the narrative does make reference to the Solomonic and Herodian Temples that once stood on the Mount. The full tour takes about 30 minutes to see/hear everything. Highly recommended.